Solar energy is a natural fit for healthcare organizations — and not just because solar reduces air pollution and makes the world a cleaner, healthier place. For starters, did you know that healthcare facilities such as hospitals, nursing homes, urgent care clinics and medical practices are the fourth largest commercial building energy consumers in the United States? Many common pieces of medical equipment — such as MRI machines and CT scanners — are in use constantly, consuming significant amounts of energy. And many of these businesses are open 24/7, with heating and air conditioning systems contributing to their sky-high utility bills. Installing a commercial solar system for a healthcare business is a smart way to slash high electricity bills and get electricity delivered more cost-effectively. There’s another way solar can improve the bottom line for healthcare businesses. Many medical facilities are at least partly owned by a physician and/or a physicians’ group. These owner-operators often have high tax bills, and solar can bring some relief via a host of solar tax incentives. One of Freedom Solar Power’s recent customers, Strictly Pediatrics Surgery Center in Austin, is an example of why solar is a great fit for healthcare facilities. In 2016, the center’s four-story building was outfitted with 2,500 SunPower® solar panels on the roof and the top floor of the parking garage, creating Central Texas’ largest solar system. This 812.3-kilowatt (kW) system produces enough clean energy to meet nearly 50 percent of the center’s electricity needs. 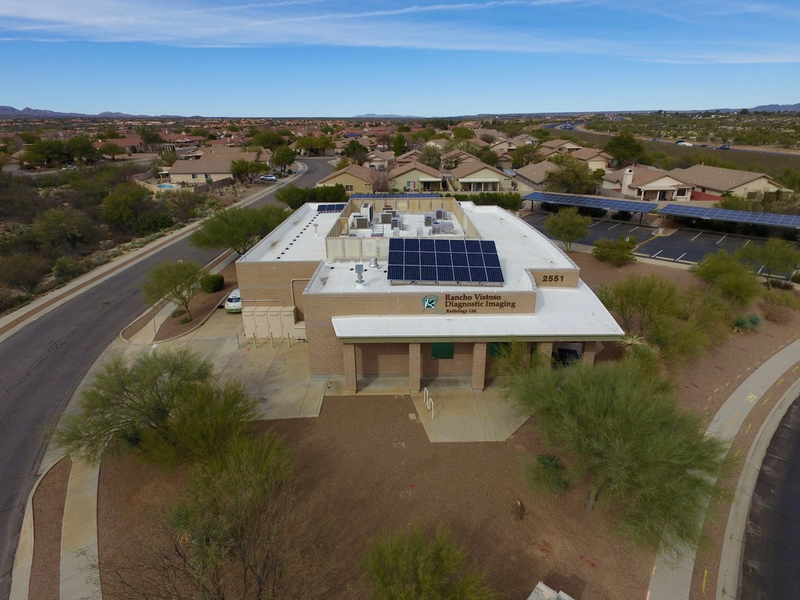 Technicians for Sustainability, in Tucson, Ariz., where the sun shines an average of 350 days a year, installed high-efficiency SunPower solar systems at four different locations of Radiology Ltd in 2016 and 2017. Technicians for Sustainability co-owner Danielle Fidel said radiology practices are the most power-hungry of all medical practices thanks to the technology they rely on for patient care. “Anything you can think of that draws a lot of power, they’ve got,” she said. The four solar systems at Radiology Ltd. generate about 1.1 million kilowatt hours of clean energy per year, annually offsetting the release of about 2.4 million pounds of carbon dioxide into the atmosphere. Using state and federal tax incentives, these systems will pay for themselves in three years and save the company nearly $145,000 in electricity costs annually. Positive Energy Solar, a SunPower commercial dealer based in New Mexico, installed a commercial solar system made up of 370 SunPower solar panels on the roof and atop a parking structure of the Southwest Bone and Joint Institute. The system meets 100 percent of the facility’s electricity needs and is expected to save more than $26,000 a year. “Couple that with federal and state tax credits and the USDA REAP grant for solar projects, which all together made our return on investment very attractive,” said Administrator Mike McMillan, in a case study you can download from SunPower’s healthcare webpage. Visit SunPower’s commercial solar website for more information about how going solar can help save businesses and organizations money and download our FAQs on Solar for the healthcare industry.